Mahajan said Mukherjee has enriched and strengthened parliamentary democracy "with expertise, vast contribution and great wisdom". 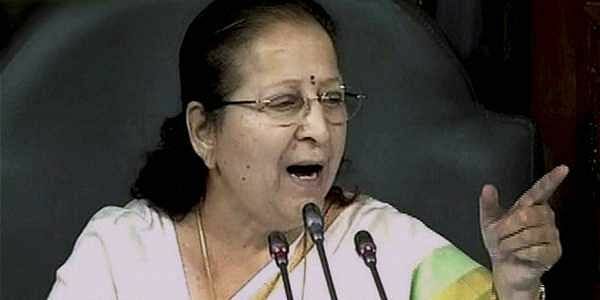 NEW DELHI: Lok Sabha Speaker Sumitra Mahajan on Sunday called outgoing President Pranab Mukherjee a "guru from whom generations of parliamentarians have received lessons". Addressing a gathering of MPs in the Central Hall of Parliament at a function to bid Mukherjee farewell, Mahajan said: "You have been a guru from whom generations of parliamentarians have received lessons on operational dynamics of parliamentary politics. "You are respected for your impeccable knowledge of parliamentary rules and procedures and exemplary memory of events and precedents." Mahajan said Mukherjee's life's journey from an humble village in West Bengal to Rashtrapati Bhavan is "entwined with contemporary history of our nation and inspiring for all". In his long political career spanning close to five decades, Mukherjee remained a member of the Rajya Sabha for four times and was elected twice to Lok Sabha. "Your achievement as a political leader, parliamentarian, administrator, author and visionary thinker are a grand testimony of your multi-faceted personality," Mahajan said of the outgoing President. She observed that Mukherjee has enriched and strengthened parliamentary democracy "with expertise, vast contribution and great wisdom". "You have always held the institution of parliament and its traditions in highest regard and upheld the dignity and decorum of both houses. You have earned the respect of all," she said.